(Bloomberg) -- Many are worried, yet few are prepared. Such is the oddity of investing in 2018, as the bull market staggers on despite cracks forming under the surface. Credit is exhibiting weakness, monetary conditions are tightening and sudden crashes are becoming the norm. Yet selling on the budding late-cycle dynamics may mean missing out on stellar returns from risk assets. At JPMorgan Chase & Co., the bank’s clients are in the throes of that conflict. Despite concerns, they’re unwilling to stray from benchmarks and take on defensive trades, according to John Norman, head of cross-asset fundamental strategy at the U.S. bank. The late-cycle signposts are coming into focus, with everyone from Bridgewater Associates to DoubleLine Capital’s Jeffrey Gundlach predicting a slowdown. But the bulls haven’t yet capitulated, leaving investors vulnerable to a slump. 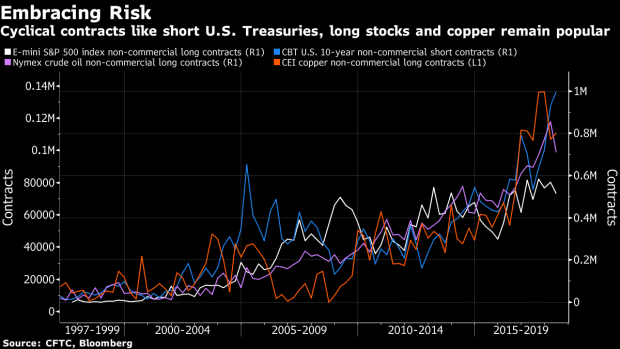 Take futures, where asset managers have driven up short contracts on the U.S. 10-year to a near-record level, according to Commodity Futures Trading Commission data. Meanwhile, long-short equity funds have been loading up on cyclical stocks versus defensive ones over the past two months, according to data from Credit Suisse Group prime services. Despite a few blips, the funds have maintained an above-average tilt this year toward companies dependent on the economic cycle. And one of the starkest examples of ignoring cycle risk lies in the credit markets, where investors are chasing yield and gravitating to short-duration corporate bonds -- including some of the riskiest junk debt. The ratio between U.S. junk-bond yields and their high-grade counterparts has reached levels that recall the pre-crisis bubble and the 1997 heyday before the Asia crisis. What should investors be buying instead? Government bonds over corporate credit, quality stocks over growth, and long oil and gold positions, Norman said. Still, despite their propensity for risk, there are some corners where investors are expressing caution over the business cycle. Stocks with high leverage ratios are being disregarded to a degree not seen since 2009, while value stocks -- ones cheaply priced -- have been cast aside in favor of stocks better suited to weather economic downturns. For those still clinging to cyclical positions, this year’s mini-shocks and regional rotations are a “teaser” of what’s to come, said Norman.